What is WEIGH DOWN ALL ACCESS? Weigh Down has The Answer To Permanent Weight Loss - over 30+ years of unprecedented results! You can do this too! START LOSING WEIGHT NOW!! 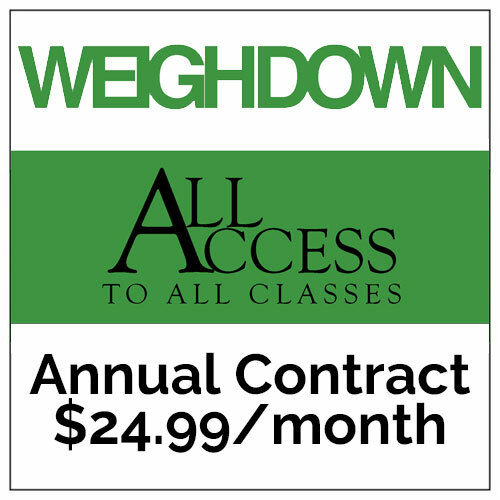 The cost for WeighDown All Access 1 Year Contract is only $24.99 a month for one year. If you have more than 4 members in your household who are actively using one account, we suggest you purchase a second account. This is a monthly recurring charge for one year with a no cancellation policy. Service begins as soon as your initial payment is processed. You’ll be charged the rate stated at the time of purchase, every month for the duration of your annual contract. Your contract will renew automatically, on your annual renewal date, until you cancel. Renewal rates are subject to change, but you will be notified of any change in your rate with the option to cancel in accordance with these terms. If you cancel within 3 days of your initial order, you’ll be fully refunded. Cancellations can be made by visiting your Your Account page or by contacting the Weigh Down office at 1-800-844-5208 and speaking with a representative. PLEASE NOTE: If you decide to break your contract before the year, you will be responsible for a $99 processing fee. I am amazed at what all is available on all access!!! This is such a great deal, and such a great blessing to me. I have used it on my iPhone, my iPad, and my Dell desktop. Talk about availability!!! God has blessed me and my family through non stop streaming TRUTH- in my house, in the car, at work, in the park. It is extremely easy to use on the app for my phone or on my desktop computer. The music is heavenly and my daughter loves dancing and praising God with all her friends on the Zion kids series! I love that there are timeless messages of truth as well as newly added content all the time! All Access is priceless!!! Weigh Down has completely changed my life! from Brentwood Food for Life! I live off of All Access! I'd starve spiritually without it. Sounds drastic but this information has drastically changed my outlook, attitude, and bottom line, my life. So thankful for life abundantly at my finger tips. I am so beyond grateful for WD All Access!! Even if we just had access to the WD classes and nothing else, it would be more than enough truth to overcome every stronghold and any sin and get a closer relationship with our Loving Father! But we DO have MUCH more than that. God has given Mrs Gwen practical sermons on being a better child towards parents, better worker, better student, how to be free of lusts of any kind, greed for food, etc! Not to mention the built in "How To Stop" tools (which are great for those testing times!! ), direct link to daily WD Chronicles, radio stations and replays, Spirit/Flesh calendars, etc. God has gifted us with amazing technology to stay plugged in no matter the location or situation and I am SO grateful for the change that has come in my life as a result of putting into practice the materials God has given us through WD. Highly recommend for anyone trying to lose weight or have a better relationship with God! from Arrington THE BEST resource on the planet! All Access gets me through the day in so many ways! I can't believe that we can access God's wisdom literally with the click of a button! SO AMAZING!